PRODUCT RATING Good. It doesn’t have the creamy texture that we have become accustomed to in conventional moisturizers, but it’s not greasy like baby oil either. The fragrance will be familiar to those that enjoy coconut candies and desserts. GREEN RATING Deep Green. Coconut is a sustainable fruit with many uses. I feel much safer putting an edible oil on my skin than I do using conventional moisturizers. Skin is our largest organ, why take chances by putting synthetic chemicals on it. 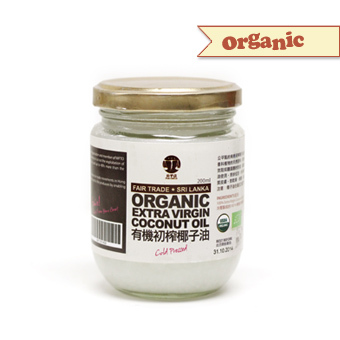 AVAILABLE AT The fair trade, organic version pictured above (HKD 159/200ml) is available online at Fair Circle. You can also buy a large bottle (HKD $32/1litre) from your local Indonesian grocer that caters to maids. They use it for cooking, but the shopkeeper told us that the lifeguards at the nearby pool use it as suntan lotion. (NOTE: It comes in a large plastic soda bottle so needs to warmed and the put into a container with a wider mouth for easy use.) According to this website, it is important to buy pure coconut oil, that is not hydrogenated, because it has a lower melting point and will not clog your pores. Most mass market moisturizers are petroleum-based and contain an ingredient list that requires a chemistry degree to make sense of. Petroleum is a non-renewable resource that is a primary cause of climate change. As petroleum becomes scarcer, we will expand extraction into more fragile ecosystems, such as the arctic. The scarcity of oil has already resulted in the nightmare that is the Canadian tar sands. Oil is extracted from the ground and is used to make a myriad of products including plastics, pharmaceuticals, cosmetics, gasoline and jet fuel. By consuming petroleum-based moisturizers we push up the economic value of each barrel of oil extracted from the ground. If we reduce the uses of petroleum, we can reduce the profits generated by the oil companies and thereby marginally reduce the incentive for further extraction. In search of a viable non-petroleum based moisturizer, we stumbled upon coconut oil. It is not liquid as what you’d expect of an oil. Instead it is solid and hard like wax. Once you rub it though, the heat melts it gently into your skin. Most moisturizers contain artificial fragrances concocted in a lab that smell really fake to me. Coconut oil on the other hand smells like…coconut. So some people may love it, while others may not. This is purely a matter of personal taste, or smell as it were. Coconut oil may not be as pleasant to use because it’s hard instead of creamy. It is however a safe, healthy choice for your skin. It is also sustainable and has a low environmental impact. Previous Previous post: Natural deodorant: Does it work? Next Next post: Why is organic food so expensive?